With an enduring Bohemian quality, golden beaches and a laid-back atmosphere, Dahab is an excellent holiday destination, particularly for backpackers and scuba divers. Dahab has both budget accommodation and fine hotels catering for the more luxury-seeking guest. It has a fiercely competitive array of seafront restaurants for open-air dining alongside the lapping waves. Dahab lies on the deepest section of the Great Rift Valley that extends down through Africa, making for dramatic underwater scenery with steep drops, valleys and canyons. Most of the diving is accessed from the shore, reached by taking a pick-up truck to the beaches stretching in either direction of the town. Some of the superb diving and snorkelling sites nearby include the Blue Hole, one of the best in the Sinai region, and the Canyon, but only TEC-divers are allowed to dive the deeper sections of such formations. Bargain hard to get classic Egyptian souvenirs like hookahs, carpets, lamps, cotton shirts and silver jewellery. Watch out for papyrus paintings made from banana leaves. In general aim to settle on 50 percent of the opening price and if in doubt stroll to the next stall where they will most likely sell the same merchandise. A good buy is Bedouin handicrafts, like embroidered fabrics. A good place to pick up general supplies is Ghazala Supermarket at the southern end of Masbat. 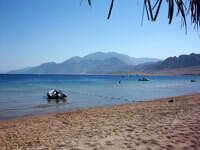 Dahab has a wide range of good quality yet inexpensive restaurants. Seafood is the key ingredient, freshly caught and served simply. The Bedouin-style restaurants on the beach are very popular as you sit at a low table with cushions close to the sand. Dahab is not really known for its raucous nightlife. Most evenings are spent by the waterfront restaurants, or in the resort bars where live Bedouin music is common. The most lively bar in town is Tota Dance Bar which offers free movies, happy hours and a weekend disco. Diving is the big draw card here, with easy access to dive sites and warm, clear waters. The Blue Hole and Canyon are both renowned for their depth and spectacular sea life. Windsurfing is also hugely popular, as the still waters behind the Dahab sandbar are blessed with an average of 300 days of wind per year. Other popular activities are camel, jeep and quad bike trips into the desert, and excursions to Mount Sinai and St Catherine's Monastery. Please note though, that although the town itself is considered safe, excursions out into the desert in the Sinai region can be dangerous and are advised against by many travel authorities and embassies due to a string of kidnappings in the area. The Blue Hole is considered one of the most dangerous dives in the world and unless the diver has completed technical dive training it should not be attempted. Watch out for scams relating to accommodation and transport. Taxi drivers routinely overcharge so always agree on a price before departure. Although Dahab is considered safe, the Sinai region outside of the major resorts can be dangerous.